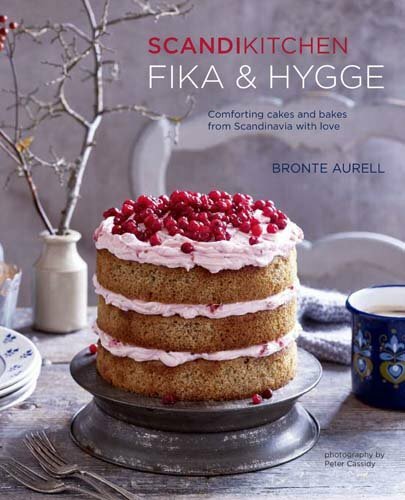 If you’ve never wished to be Scandinavian before, Scandikitchen: Fika & Hygge will fix you. Especially if you pick up this calm-inducing book filled with snowy images on a stifling summer day: You’ll forget about their long, dark winters and just revel in the beauty of photo after woodsy photo of rustic and fancy cookies and cakes alongside coffee and teapots and beautiful women in furry hats. The photos depict the peaceful joy underlying the title, as author and owner of London’s ScandiKitchen Café Brontë Aurell explains: The Swedish word fika means to meet over coffee and a sweet for a chat, which Swedes traditionally do twice a day; it also means the sweet treats themselves. Hygge, pronounced who-guh, began as a Norwegian word now largely used in Danish to mean “the sublime state of inner warmth or satisfaction you feel when you are spending time with loved ones and nothing else matters.” It can, Aurell says, be enhanced by a log fire, a hot drink and a sweet treat . . . and she does have some terrific sweet treats to suggest. Aurell opens with some basics—all pleasingly listing ingredients both in grams and cups—including a sponge cake base, pastry cream, homemade marzipan, and, of course, Danish pastry. The Danish pastry recipe, while straightforward and tasty, may still put off many readers looking for quicker recipes—but that affects only a few full recipes later in the book. What readers shouldn’t skip is the marzipan recipe and recipes that use it. This simple food processor recipe will keep cooks from ever needing to use the far-sweeter store-bought versions instead, and makes a great base for the classic almond paste filling for Danish pastries and buns. The book opens with simple chocolate-dipped coconut cookies optionally flavored with cardamom—a great introduction to the power of freshly ground cardamom for American bakers who rarely use this spice. It pops up again blended with ginger, cloves, cinnamon, allspice, and orange zest in a terrific version of the classic Scandinavian ginger Christmas cut-out cookies. Crisp and rich, the cookies come from a silky dough in a large quantity perfect for Christmas get-togethers. Slice-and-bake “Jewish Biscuits,” fragrant with cinnamon sugar and almonds, and Daim cookies—essentially chocolate chip cookies filled with bits of chocolate-covered toffee bars—produce quick and satisfying treats. Pretty “Nothing Biscuits,” with a lemony butter-cookie base that’s a dream to roll out and cut into small circles topped with a chewy-crispy swirl of meringue, take only a bit longer. Aurell goes on to simple “traybakes and no bakes” such as Norwegian apple cake, coconut-topped sponge cake, and “everyday” Bundt cakes, layer cakes, cake squares, and tarts. The treats surpass their “everyday” label in looks alone—honey cake squares filled with buttercream and topped with cocoa icing, or a gingerbread layer cake that graces the book’s cover. The only bump could come in trying to find frozen lingonberries for the gingerbread cake—but barring that, raspberries will do. Many other temptations fill this chapter, from a plum and black pepper tart, which puts the homemade marzipan to good use, to “success cake,” with an almond and egg white base topped with a rich custard buttercream and chocolate shavings. Another easy and attractive recipe, this requires just a few ingredients to produce a simultaneously light and rich result (similar to Daim cakes available in Ikea). Aurell moves into fancier cakes, from small bites that still stick to pretty basic ingredient lists and techniques, to full-size “celebration cakes” that fewer readers may want to tackle—but will still drool over. And many of her recipes, because of their dependability and simplicity, lend themselves to experimentation and substitutions—for example, when faced with a surfeit of egg whites, make just the tasty meringue base of the hazelnut and mocha squares and quickly top it with whipped cream and chocolate shavings, or a smear of Nutella and cream. She closes with a short chapter on pastries and breads, including semla buns, cinnamon buns, and chocolate buns, Finnish doughnuts, and exceptionally good aebleskiver—little pancakes puffs. And in case you’re overdosing on sugar by this point, the last recipe will tempt in an entirely different way—large, flat, light-rye rolls ready for sandwiches or a topping of sweet butter. A few mild concerns: Sometimes things seem slightly off—baking times often seem a bit short; the tested Nothing Biscuits yielded nearly 90 cookies, far more than the 35 listed, and the topping ran short to cover them all. But the extra buttery bases tasted good dipped in chocolate or sandwiched with a touch of jam. American bakers will also want to look twice at ingredients—when Aurell calls for caster sugar, sometimes that’s translated as granulated sugar, other times as superfine. This matters in the meringue for the Nothing Biscuits—and it’s easy to miss. But overall, bakers will want to keep trying the next recipe and the next. About the only reason to avoid the book would be an almond allergy; otherwise, curl up in front of a fire with a strong cup of coffee, a plate of Aurell’s treats, and a few friends—and pass the book around to luxuriate in its photos for some sweet Scandinavian dreaming.